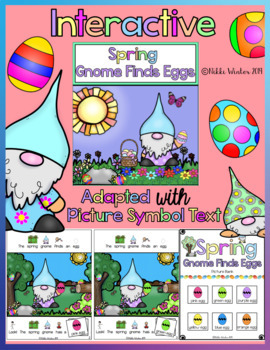 "Spring Gnome Finds Eggs" is an adapted & Interactive colorful book. This book has picture symbol text support above the words to help ELL/Autism/Special Education students. 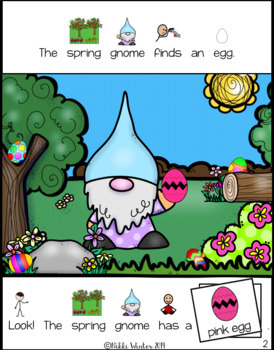 The Gnome finds different color Easter Eggs! Comprehension with Multiple Choice Picture QuestionThere are 4 different Picture Comprehension Book Assessments with 2 versions per Level. Comes with Answer Keys. 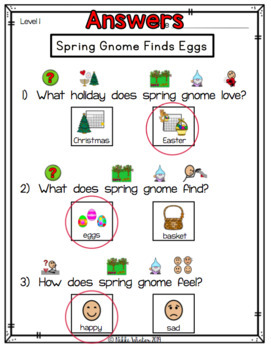 Level 1: Field of 2 picture Comprehension (1 version with picture symbol text support and one without picture symbol text support). 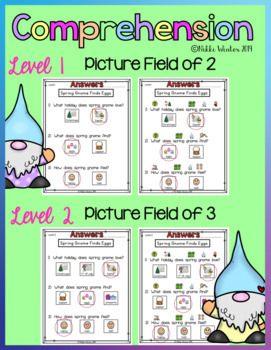 Level 2: Field of 3 picture Comprehension (1 version with picture symbol text support and one without picture symbol text support). This is an interactive book with 7 pieces that velcro onto the book. This requires very little prep! Just print, laminate & velcro!